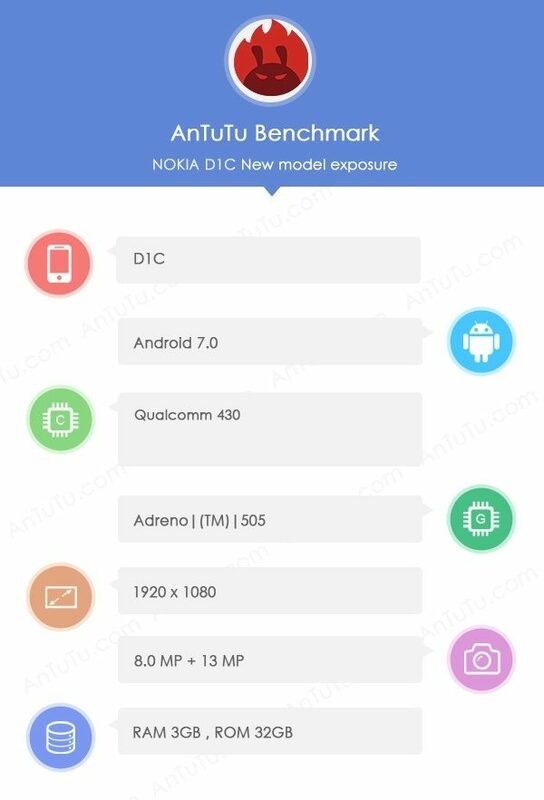 Upcoming Nokia D1C paid its visit to AnTuTu - Playfuldroid! The upcoming Android-based Nokia D1C which was recently being spotted at Geekbench a couple of times has now made its way to Chinese benchmark app, AnTuTu. Of course, some of its key specs has been revealed via the listing as well. The leaked specs include a FHD display panel, Snapdragon 430 SoC, 3GB of RAM, 32GB internal storage, 13MP main snapper, 8MP front-facing camera, as well as Android 7.0 running out of the box. In case you missed out, the Nokia D1C picks up a highest multi-core score of 3229 via Geekbench, which also reaffirmed the above specs from AnTuTu. From what we have learned so far, Nokia is slated to unveil two new Android smartphones.